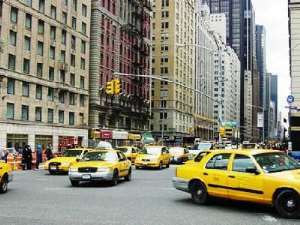 .... Study of NY Taxi Drivers Finds More Immigrants at Wheel A new study on the people who drive New York City's taxicabs shows that the number of yellow taxicab drivers from Ghana has crept up over the past decade. The study paints a rare portrait of this harried work force and reveals that extraordinary numbers of the city's newest immigrants continue to flock to the industry. Anyone who rides yellow taxicabs or livery cabs regularly knows that many of its drivers are immigrants, but no one had broken down the numbers using recent data. The previous study on the driver population, done by Bruce Schaller, a taxi industry consultant based in Brooklyn, used information taken from 1991. The new report, released yesterday by Mr. Schaller, analyzes 2000 census data and Taxi and Limousine Commission licensing records. Currently, 99,400 drivers are licensed by the commission to drive yellow cabs. ¶Eighty-four percent of taxi and livery drivers in the city are now immigrants, up from 64 percent in 1990 and 38 percent in 1980. ¶Drivers from the West Indies (Dominican Republic or Haiti) make up the largest portion of yellow cab and livery drivers, 23 percent, according to 2004 licensing data. They are followed closely by drivers from South Asia (Pakistan, India or Bangladesh), who make up 20 percent of drivers over all. ¶The ranks of yellow cab drivers, however, are dominated by South Asian immigrants, who make up about 38 percent of drivers (14 percent from Pakistan, 14 percent from Bangladesh, 10 percent from India). The next largest group is Haitians at 9.6 percent. ¶Bangladeshi drivers have supplanted Pakistanis as the largest percentage of newly licensed drivers of yellow taxicabs. Of those who entered the business in the last two years, 18 percent were from Bangladesh, 15 percent from Pakistan and 9 percent from India. The trends in the industry largely correspond with the changing face of the overall immigrant population, Mr. Schaller said yesterday. The growing number of new Bangladeshi drivers, for example, reflects a sharp increase in Bangladeshi immigration to the city, from 400 per year in the 80's to 3,900 per year in the mid-90's. But beyond the general increase in their numbers in the city, Mr. Schaller said, there is also a word-of-mouth phenomenon among Bangladeshis. "Certain immigrant groups have chosen to make taxi and limousine driving their niche business," he said. "Just as you have Korean grocers, you have South Asian taxi drivers. "It's the classic immigrant story. A few newcomers get started in the business. Their friends and relatives come over and join them in the business." Another trend that is beginning to show up in driver ranks, Mr. Schaller said, is the growing population of Africans in the city. The number of yellow taxicab drivers from Egypt, Morocco, Ghana and Nigeria has crept up over the past decade. The percentage of newly licensed drivers from those four countries rose from 9.2 percent in 1991 to 14.5 percent today. The cab industry is attractive to immigrants because it is relatively easy to get into and offers opportunities for people who may not speak English fluently, Mr. Schaller said, though they do have to pass an English exam to become drivers. Mr. Schaller also looked at national data on taxi and limousine drivers. Among his findings: 38 percent of drivers nationwide are immigrants, according to the 2000 census. Only tailors and farm laborers had a higher percentage of immigrants in occupations with at least 50,000 workers.